The other day, my youngest daughter Clare looked down at her fleece pants and said, “It’s like a big fur ball exploded all over me.” We looked down and her pants were half white from the mounds of white fur from our Great Pyrenees Bella. This week, Clare was studying Chinese New Year in her class. One thing I learned about Chinese New Year is you aren’t supposed to clean your house on the Lunar New Year’s Day itself because it is said it will sweep away your good luck for the year. I think North Americans have become obsessed with cleanliness. I’ve been in people’s houses where after they’ve cleaned off a few crumbs from their kitchen counter, they spray it with some kind of antiseptic. I’m not sure how we got to this state where we can’t even live with a crumb on the counter. It’s crazy. What’s wrong with a bit of dirt and dust anyway? Personally, I think it’s healthy. Anyone who knows me knows I have these crazy theories, and one of them is cleaners and the uber-sterilized environments we’ve created in our homes have contributed to a higher incident of allergies amongst children. I know there’s all sorts of studies on this, but think about it, how can you build up any kind of immunity to the normal germs and dirt that surrounds us if you antiseptic it away? But my biggest issue with housework is it just takes too much time and cuts into the things I really want to do on my weekend, like skate on the lake, toboggan, play the piano, and hang out with my family. So this week’s Happy Act is to take a break from the dust and dirt. Hang up your broom and don’t worry about housework for one weekend. Enjoy the free time and feel good knowing you’re not sweeping your luck away for 2014. Note: Not all Happy Acts I blog about will make you feel happy, so feel free to take a pass the odd week. I know some people who absolutely love cleaning. If that’s the case, roll up your sleeves and clean away—tackle a closet you’ve been meaning to clear out. Whatever makes you happy (or call me, seriously, call me—the fur balls are multiplying). TIP FOR THIS WEEK: If you live in the Ottawa or Kitchener-Waterloo regions. Frank Warren from postsecret.com is speaking at Carleton on Feb 5, U of O on Feb 6, and Wilfrid Laurier on Feb 7th. You can read a bit about Frank’s blog on my About page, which I’ve just updated. Great job Laurie! 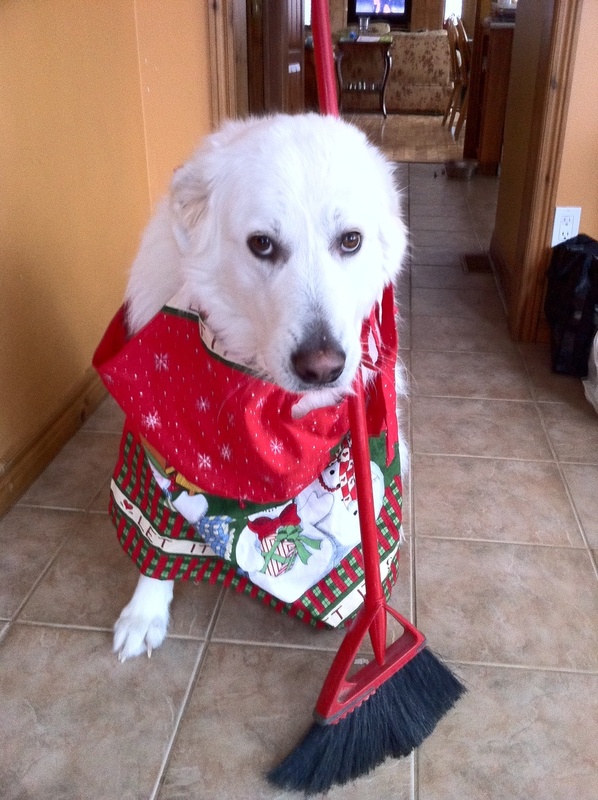 With a golden retriever in the house, I could clean non-stop if I wanted to. Me too, Ray. One tip I forgot to share, especially if any of you have hardwood floors, is for Christmas we bought Dave’s parents one of those robotic sweepers that just roam around the floors and clean up all the dust and fur. They work really good and are a great cat toy too! Other tip: if you can afford it, get a housekeeper to come in every 2 weeks–best $70 or $80 of your money you’ll ever spend!